Pickle-Centric Recipes — Preservation & co. Shake together the beet brine, olive oil, mustard, 1 teaspoon of salt, and 1/2 teaspoon pepper and set aside. Toast almonds in a dry, heavy skillet over medium heat for 1 to 2 minutes or until they're golden brown and they give off a rich, toasty fragrance. Place the arugula in a separate bowl and toss it with enough vinaigrette mixture to moisten. Put the arugula on a serving platter and then arrange the beets, almonds, and goat cheese on top. Drizzle with additional vinaigrette, if desired, sprinkle with salt and pepper, and serve at room temperature. 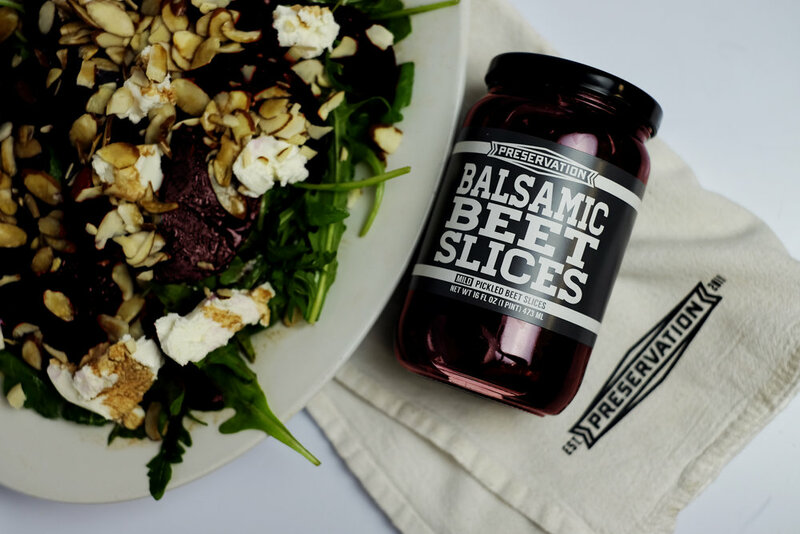 Balsamic Beet Slices - Preservation & co.